On February 25, 2012, former Detroit Tigers right-handed reliever Joel Zumaya experienced pain in his elbow after throwing 13 pitches in live batting practice for the Minnesota Twins. He tore the Ulnar Collateral Ligament in his elbow likely requiring Tommy John Surgery, therefore, ending his 2012 season before it started. On January 15, 2012, he agreed to a one-year contract worth $800,000--1.7 Million based on possible incentives. Now he is guaranteed to earn $400,000. After hearing this news, it's sad because he'll always be known for his 100 plus miles-per-hour fast balls. He was a major part of the Tigers run to reach the 2006 World Series appearing in 62 games, 83.1 innings, 97 strikeouts, a 6-3 record with a 1.94 ERA. In five years, Zumaya has a 13-12 record with a 3.05 ERA in 209.2 innings with 210 strikeouts in 171 games. I really hope we haven't seen the last of the 27-year old. Careers have been revitalized because of Tommy John Surgery. Although former Tigers pitcher Frank Tanana never had Tommy John Surgery, he was a left-handed flame-thrower, who re-invented himself by becoming a crafty finesse pitcher that had a 21-year career record of 240-236. Thirty-years before Zumaya was thrilling fans with his power, Mark "The Bird" Fidrych captured the national spotlight by packing Tiger Stadium in 1976. The Baseball World gravitated to watching him talk to the ball, in addition to his numerous mound antics. Fidrych was selected to the American League All-Star Team and started the game. He finished the season with a 19-9 record with a 2.34 ERA with 24 complete games in 250.1 innings. He won the American League Rookie of the Year. He was a two-time All-Star and finished his five-year career with a 29-19 record, 3.10 ERA and 170 strikeouts all with the Tigers. Fidrych's injury problems began in 1977 when he tore the cartilage in his knee fooling around in the outfield during spring training. 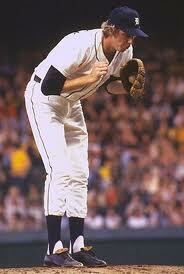 He would later hurt his arm against the Baltimore Orioles, that would ultimately be diagnosed as a torn rotator cuff. If there is a tale of two pitchers that were so different but so similar, then this is it. One was a 100 mph fire-baller while the other was an inning eater. Nowadays, pitchers would be lucky to complete 24-games in a career, yet these days, it's common to see 100 mph hurlers. In either case, these two had "Dead Arms" which shortened their careers. Each started and ended their five-year careers sporting the "Old English D" in the Motor City. Fidrych died April 13, 2009 at the age of 54 which is 27 or half of Zumaya's age. Fidrych was killed working on his truck outside his home in Northborough, Massachusetts. It's hard to believe that it's been nearly three years since Fidrych passed away. Zumaya can only hope his career does resume. Hopefully, he won't die at a young age. It's so sad to see a pair of young hurlers with so much potential fail to reach and sustain superstar status. Yet, they both experienced the big stage with Zumaya in the 2006 World Series and Fidrych in the 1976 All-Star Game. What a difference 30-years makes and hopefully there is a continuation of the Zumaya Story.